Azur 1/32 Caudron C.714C.1 "Finnish Service"
The original specification that led to the C.710 series was offered in 1936 in order to quickly raise the number of modern aircraft in French service, by supplying a "light fighter" of wooden construction that could be built rapidly in large numbers without upsetting the production of existing types. The contract resulted in three designs, the Arsenal VG-30, the Bloch MB-700, and the C.710. Prototypes of all three were ordered. The original C.710 model was an angular looking design developed from an earlier racing design series. One common feature to all of the Caudron line was an extremely long nose that set the cockpit far back on the aircraft. The profile was the result of using the 450 hp (336 kW) Renault 12R-01 12-cylinder inline engine, which had a small cross section and was fairly easy to streamline, but very long. The gear were fixed and spatted, and the vertical stabilizer was a seemingly WWI-era semi-circle instead of a more common triangular design. Armament consisted of a Hispano-Suiza 20 mm HS-9 cannon under each wing in a small pod, with an option for a third firing through the propeller spinner. The C.710 prototype first flew on July 18th, 1936. Despite its small size, it showed great potential and was able to reach 470 km/h in testing. Further development continued with the C.711 and C.712 with more powerful engines, while the C.713 which flew in December 1937 introduced retractable landing gear and a more conventional triangular vertical stabilizer. The final evolution of the 710 series was the C.714 Cyclone, a variation on the C.713 which first flew in April 1938. The primary changes were a new wing airfoil profile, a strengthened fuselage, and instead of two cannons the fighter had four 7.5 mm MAC 1934 machine guns in the wing gondolas. It was powered by the newer 12R-03 version of the engine, which introduced a new carburetor that could operate in negative gee. The Armee de l'Air ordered 20 C.714s on November 5, 1938, with options for a further 180. Deliveries did not start until January of 1940. After a series of tests with the first planes it became apparent that the plane was seriously outdated. Although light and fast, its wooden construction did not permit for a better engine to be mounted, which seriously limited its vertical speed and maneuverability. 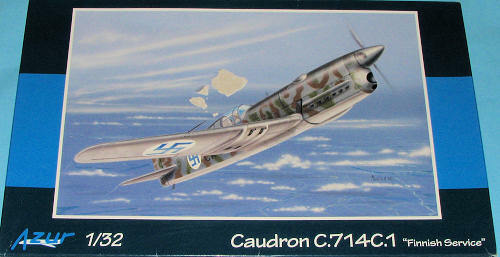 Because of that the following month the Caudron was withdrawn from active service in February of 1940. In March the order was reduced to 90, as the performance wasn't considered great enough to continue production. Fifty were diverted to Finland to fight in the Winter War. Six were on their way and a further ten on the docks when the war ended and further shipments were halted. While six aircraft were delivered and assembled, they were soon found to be unreliable and dangerous to use in Finnish conditions, and were never used in combat. On May 18 35 of Caudrons were handed over to the Polish Warsaw Squadron - the Groupe de Chasse polonaise I/145, stationed at the Mions airfield. After 23 sorties the bad opinion of the plane was confirmed by the front-line pilots. It was seriously underpowered and was no match for the enemy fighters of the epoch. Because of that, on May 25, only a week after it was introduced in active service, French minister of war Guy la Chambre ordered all of C.710's to be withdrawn from active service. However, since the French authorities had no other planes to offer, the Polish pilots ignored the order and continued to use the planes. Although the plane was hopelessly outdated compared to the Messerschmitt Me 109E's it faced, but the Polish pilots nevertheless scored 12 confirmed and 3 unconfirmed kills in three battles between June 8 and June 11, losing 9 in the air and 9 more on the ground. Interestingly, among the planes shot down were four Dornier Do 17 bombers, but also three Messerschmitt Bf 109 and five Messerschmitt Bf 110 fighters. The plane was also used by the Polish training squadron based in Bron near Lyon. Although the pilots managed to disperse several bombing raids, they did not score any kills nor did they loose any machines. By the end of June when France fell, only 53 production machines had been delivered (although the number varies, 98 is another common figure). Other projected versions were the C.720 trainer with a 100 or 220 (75 or 164 kW) engine, the C.760 fighter with a 750 hp Isotta-Faschini inline engine, and the C.770 fighter with an 800 hp (597 kW) Renault V-engine. 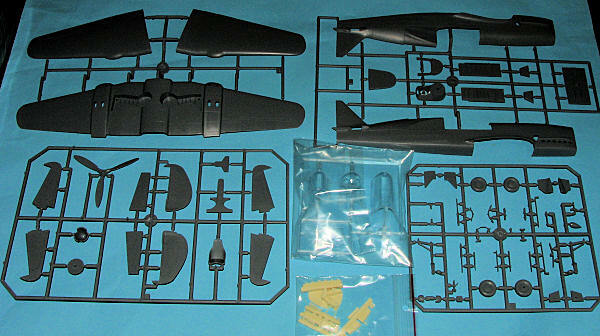 First off, though it is 1/32, it is not a large aircraft so there is a great deal of space in the box. Four grey and one clear sprue are in there along with a small bag of resin and a photo etch fret. 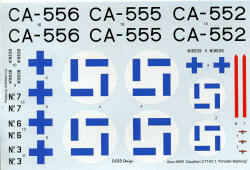 The decal sheet has the swastikas in sections and covers three planes that are pretty much the same other than serial number. As a note, no two French planes were painted the same so you have a lot of leeway when it comes to camo. Anyway, typical MPM/Special hobby plastic with ejector towers on some of the larger pieces. I do like the fabric representation as they get away from the 'China Syndrome' of basically showing all the underlying rib and stringer detail. Some like it, some don't. The rudder and elevators are separate, though the ailerons are not. The kit has the large gun pods molded to the lower wing and thankfully, the wheel wells are also molded in place. A most complete cockpit is provided with the majority of resin and photo etch bits being used there. The instrument panel has nicely done instrument detail. Having a decal as an option would have been nice two. There are two sidewalls on which one can put a number of components as well. There is a photo etch harness set to add to the seat. For the engine, we have a resin engine face and resin exhaust to put on the inside of the cowling. The landing gear on the C.714 were somewhat complex and this is well represented with the kit. Clear parts are clear enough to see all the detail you put into the cockpit and a canopy open option is provided. On this plane, the canopy sections slid down into the side of the aircraft. The windscreen looks odd at first, but appears to be a good representation. I like that for this and the rear quarter windows, they have included sections of airframe to make it easier to blend in. Some drilling is needed for a few pieces, but the instructions show exactly where to do so. Instructions are quite large so the construction drawings are able to be quite unambiguous as to what goes where. As mentioned, three Finnish options are provided in this boxing and the decals are superbly printed by Aviprint. Ffor those (like me) who wanted to do a French plane but found the French boxing sold out, there is an aftermarket sheet by Camouflage and Decals that I will be using on mine. I know that I like this one and it is already being built. 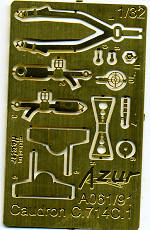 If your penchant is for French planes or 1/32 models, this is one you really should look for.